Built by North American as a model D-5. Delivered to the U. S. Army. Ferried overseas via Hawaii to Australia. Assigned to the 5th Air Force, 345th Bombardment Group, 499th Bombardment Squadron. Modified at the 4th Air Depot at Garbutt Field near Townsville into a staffer version (B-25D-1). Assigned to pilot Jack Broadhurst. Nicknamed "Flying Ginny" after Broadhurst's wife on the left side of the nose. Co-pilot Whipple painted his wife's name on the right side "Bette". After Broadhurst left the squadron, 1st Lt Chandler S. Whipple took over the aircraft. Crew chief was Howard B. Moore. When lost, engines R-2600-13 serial number 41-28451 and 42-77632. On October 5, 1943 took off from Port Moresby on a barge sweep along the north coast of New Guinea near Bogadjim. After shooting up ten barges, some B-25s flew inland to look for more targets in the vicinity of Erima Plantation. While flying at low level, this B-25 was hit by intense anti-aircraft fire and was seen with the cockpit and nose section completely enveloped in flames. 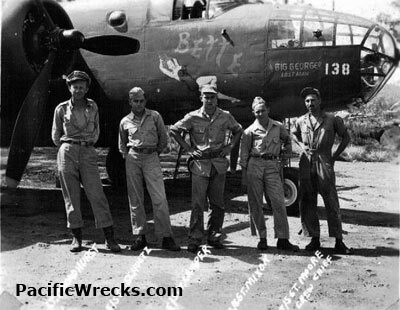 The damaged B-25 continued on course for a moment then crashed into the ground, killing the entire crew. During November 2002, this B-25 was visited by a team from U. S. Army CILHI and coded "PNG #45". Whipple has a memorial marker at Homeland Cemetery in Bristol, NH at section 21W, lot 6, grave 5.1. Tuttle has a memorial marker at Rutledge Cemetery in Poteet, TX. Shultz has a memorial marker at Mount Lebanon Cemetery in Lebanon, PA at section S.
"I'm the grandson of the late Howard B. Moore that was the crew chief of the Flying Ginny / Bette." American Battle Monuments Commission (ABMC) - Walter C. Shultz Jr.